View of "Good Defeats Evil", a sculpture presented by the Soviet Union to the United Nations on the occasion of the organization's 45th anniversary. 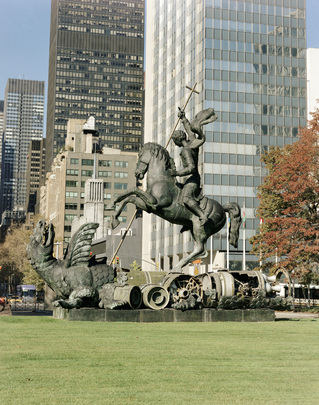 The sculpture, which depicts St. George slaying the dragon, is created fragments of Soviet SS-20 and United States Pershing II nuclear missiles. Georgian artist Zurab Tsereteli created the sculture to commemorate the dismantling of the missiles under the Intermediate-Range Nuclear Forces (INF) Treaty signed on 6 December 1987 by Presidents Ronald Reagan of the United States and Mikhail Gorbachev of the Soviet Union.